Africa undressed: the continent pictured with no clouds in the sky. This is not a natural state, of course; there is always a weather system bubbling up somewhere. But if you have access to a lot of images acquired over the course of several months, it becomes possible to construct a mosaic. This one was produced from observations made by the EU's new Sentinel-2a satellite, which is now routinely mapping Planet Earth. It is a powerful capability. Sensitive across 13 spectral bands (colours) and able to see details as small as 10m across - the spacecraft's camera "carpet maps" the land surface beneath it. Every strip is 290km wide. And if you think about how fast the satellite is moving in orbit - that is a large swathe of real estate to scoop up at once. It means, for example, that for an elongated country like Norway, it is possible to capture almost its entire territory in just one pass. Some 290,000km2 in just four minutes. Half of Spain can be done in two minutes. The Sentinel's free and open data is being used for all manner of applications - from urban planning and crop monitoring to climate studies and biodiversity assessments. Cloud is the enemy, though. Although the Sentinel's colour camera can remove light clouds like cirrus, a thick deck is impenetrable. And for tropical regions, this is a significant issue. "We have many orbit segments going from Norway down to the Sahara with only marginal clouds. But when it comes to the tropics, such acquisitions get rare," explained Dr Bianca Hoersch, the European Space Agency's (Esa) mission manager on Sentinel-2a. 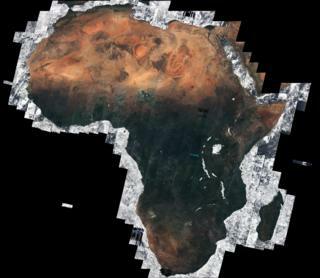 "For this Africa composite, the Climate Change Initiative team took for the tropical part any useful orbit segment, going down to single cloud-free pixel selection, from any data acquired between August 2015 and April 2016." The full image contains 32 terabytes of data. Only the African Great Lakes, including Victoria and Tanganyika, have been left in a cloudy state. That said, there are Sentinel-2 scientists who are just as keen to get clear views of inland and coastal water bodies, to track sediment flows, algal blooms, pollution incidents, and the like. The interest in the data was evident at last week's Esa Living Planet Symposium. Many of the sessions dedicated to the satellite's work were standing room only. The spacecraft is not quite working to full capacity. It is still in the ramp-up phase following its launch last June. It has just gone to mapping every part of the Earth's land surface (cloud or no cloud) at least once every 20 days, and hopes to get that down to every 10 days by the end of the year (Europe and Africa are already mapped at this rate). A new X-band radio ground station is being made available to downlink the additional data volume. Some of it will also be sped to Earth via a laser link. In a year's time, Sentinel-2a will be joined in orbit by a sister platform, Sentinel-2b. This second platform will permit a re-visit time of just five days - making it much easier to achieve those cloud-free segments. Looking even further to the future, the EU is determined the imaging capability should be available deep into this century and has asked Esa already to procure an additional pair of satellites, Sentinels 2c and 2d. "Those two spacecraft will potentially be available to launch in 2020 and 2021," said Sentinel-2 project manager François Spoto. "The concept is not to have four spacecraft in orbit, but it will create enough spacecraft assets to replenish the constellation if and when required."